Recently Facebook released Messenger lite in almost 100 countries. 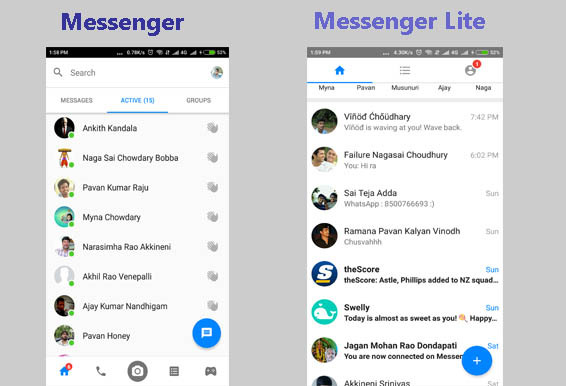 Just like FLite(facebook lite), messenger lite is aimed at lower end devices so that they can experience faster and smoother functionality. Messenger lite has a very clean UI. But it lacks some major features which do affect your experience. Messenger Lite provides you very basic functionalities like chatting, sending images, gif, videos, check whether a person is online or not. It is clear that we have to sacrifice some functionalities for a smoother experience. You can’t add your day in messenger lite. You can’t even see others stories. You can not see the complete list of people who are online. It shows you some random active people. Messenger Lite is not available for iPhone users in some countries. We can play games in Messenger, whereas in messenger lite no such feature is available. Since Messenger Lite uses fewer resources, it increases your battery standby time. If you have battery issues then this app is for you. Messenger Lite runs smoothly with low internet connections. Provides all basic features that you expect from a regular app. Clearly, Messenger Lite is not a replacer of existing Messenger, but it is definitely the best alternative. Messenger Lite definitely increases fastness and smoothness, but at cost of some important features.